For the third year in a row, Poutine Palooza brought a crowd to watch the poutine eating contest, taste a variety of poutines and find out which restaurant had the best poutine in town. MADAWASKA, Maine — For the third year in a row, Poutine Palooza brought a crowd of spectators to watch the poutine eating contest, taste a variety of poutines and find out which restaurant had the best poutine in town. The poutine eating contest, sponsored by Big Rick’s Burgers and Wings, had the most contestants this year. Fourteen men and women bellied up to the table to scarf down as much poutine as they could in a 20-minute time period. Each contestant was given a to-go box filled with 2.5 pounds of Big Rick’s traditional poutine to start. 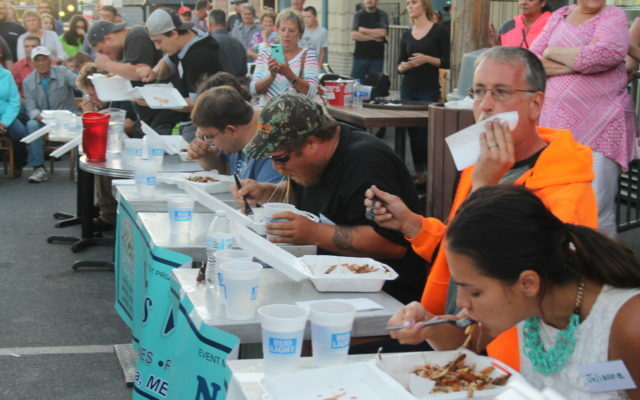 After each box was emptied, another was placed in front of the contestants, and they continued to consume as much as possible. Many contestants had to tap-out around 5 pounds, but several stayed until the end. Chris Cyr of Grand Isle, who won second place in the contest, said that he was surprised he placed at all. Cyr decided to recycle the prize money of $100 back into the community Saturday morning. The winner of the poutine eating contest was Zachariah Miksch, originally from Pennsylvania. Miksch moved to Presque Isle with his wife for work last year. “I entered on a whim when we decided to drive the hour plus to the palooza because I like eating and I like competition,” Miksch said. Miksch attributes his winning to his double fork alternating style. Down on the other end of Party du Main Street, Mainely Meat ‘n Potatoes opened up its food truck and served only poutines. But it offered more than just the traditional. Rita Dionne, the matriarch of the family-owned mobile eatery, came up with new variety of poutines and still offered the eatery’s famous DONAIR poutine. With the help of her family’s ideas, Dionne created 10 new poutines, including a Big Mac poutine that was requested by multiple to people for it to become a permanent addition to the menu. “I come from a cooking family, and I put quality, pride and my heart into it,” she said. The family food truck sold around 310 poutines Friday night, using close to 600 pounds of potatoes. The evening ended with the announcement of the Best Poutine Restaurant Contest results. Roy’s Variety won third place for its Romeo poutine, in honor of the Romeo poutine from Rosette’s Restaurant in Frenchville that closed about two years ago. Morin’s Variety took second place with its breakfast poutine. First place was awarded to Orchid’s for its bananas foster sweet potato poutine. Finally, the award for the best traditional poutine went to Big Rick’s Burgers and Wings.